"Miss Grace Sutherland was one of the seven Sutherland sisters, a group of singing ladies from Lockport/ Niagara, N.Y., that were famous for their very long hair. The sisters spent much of their time travelling from city to city in side-shows from about 1882 until about 1907: in 1882 with W.W. Coles Colossal Show, by 1884 with “Barnum and Bailey’s Greatest Show on Earth”, and also posing in drug store windows or hotels lobbies. On group photos the sisters were always placed in such a way that it seemed all of the sisters had hair reaching the floor. Grace Sutherland had five feet long, auburn mane. All of her life she was very proud of it. She never married and lived until 1946." So where can you go with your theming. Marilyn - who chose the image - suggests "very long hair, mantelpiece, statuette, books, and carvings", and you might like to add CdV's to that list. However long or close cropped your entry is going to be, all you need to is to post your post on or around Saturday 31 May 2014 and link your post to the list below. Before you start combing through your collection here is a little preview of what is to come in the weeks ahead. 231 : The only theme this week is the lack of a theme. Follow that. 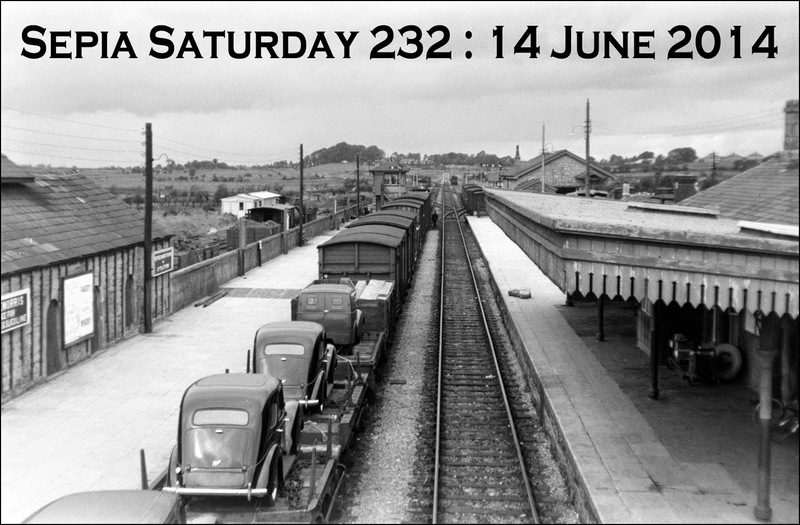 232 : Transport by car, transport by train, transport by cars on trains, transport. Those sepians who can see through their fringes will have noticed that I have not been around too much over the last few weeks. 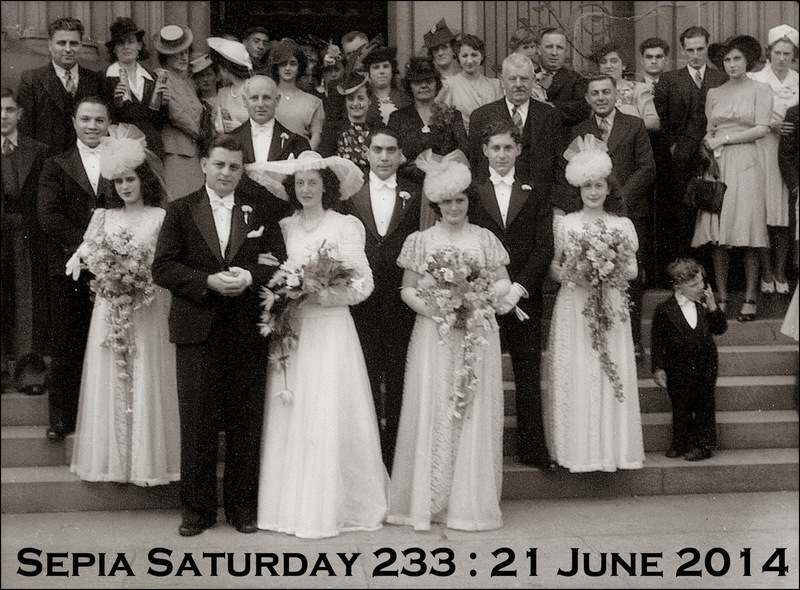 Things are a little hectic around Sepia Towers at the moment in preparation of my son's wedding on the 21st June. And the 21st June just happens to be a Saturday, of course. I would love to invite you all to the event - and in a typically sepian way, I can. So, with your permission, I would like to dedicate our theme for Sepia Saturday 233 to Alexander and Heather. But all that is for the future. 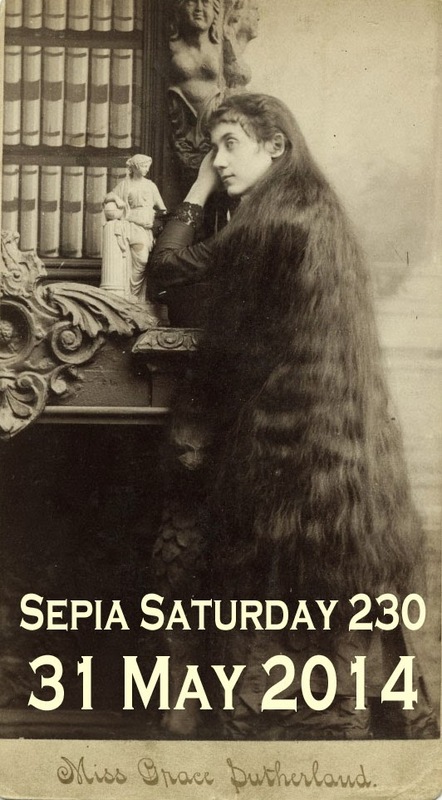 For the moment get your hair in order and get set for Sepia Saturday 230. Our theme image for Sepia Saturday 229 - post your posts on or around Saturday 24 May 2014 - comes from the Flickr Commons collection of the State Archives of North Carolina and shows a dorm room at a typical North American College in 1917. It is a print from a glass plate negative and it would appear to have suffered from the ravages of time. There are a host of possible themes you might like to follow ranging from the girls in their room to the pennants and banners on the wall or even that somewhat rudimentary plumbing next to the window. I must confess to being a little taken with the wallpaper - I am sure I used to have some like that in my bedroom when I was young. 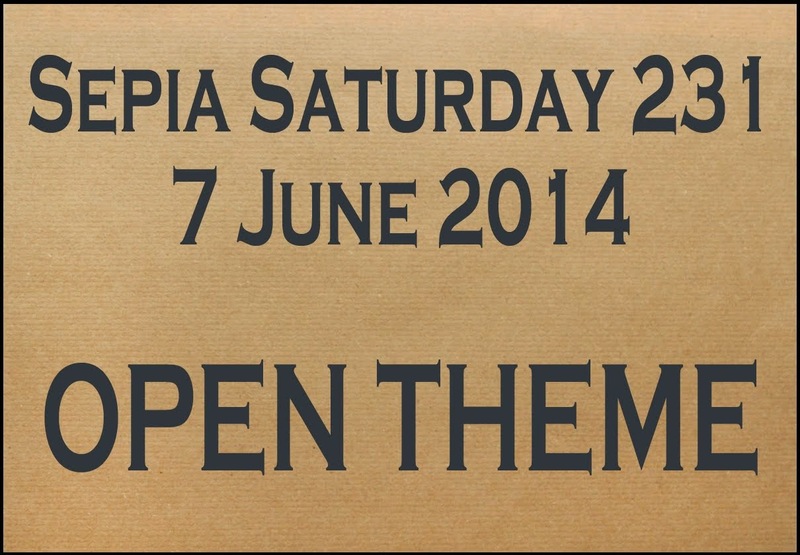 Whatever you decide to go with, just post your post, link it to the list below and fly the Sepia Saturday pennant on your blog. But before that, take a look at what exciting things lie just around the sepia corner. Such things are for the future. 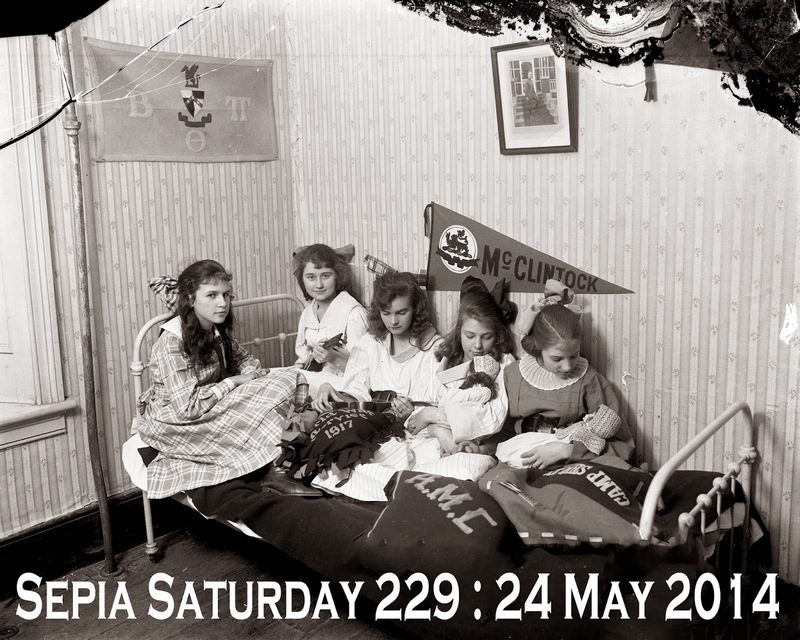 Now it is time to go to your rooms and see what you can come up with for Sepia Saturday 229. Good luck. What on earth is happening in this 1904 photograph from the Collection of the National Library of Ireland? If you look at the Flickr Commons page for the image, it is full of information about who it features, where it was taken, what the weather was like that day : but it is strangely quiet on the greatest mystery of all, what are they doing? There clearly is an Edwardian lady and a young lad in a sailor suit and they seem to be filling a bag with sand. But why? If you are hoping to follow a theme this week you can go with the seaside, with the sand, with the sandbag, with the sailor suit or you can work out what they are playing at and match that. Whatever you choose to do, just post your post on or around Saturday 17th May 2014 and then add a link to the list below. Before the sands of time run out for Sepia Saturday 228, you might like to take a look forward at what is coming over the next few weeks. Saturday. As long as its old and an image - post it. Now that gives you something to think about, doesn't it? But there again you will need something to think about whilst you are filling all those sand bags. Who says Sepia Saturday participants are not given enough choice when it comes to our weekly theme? 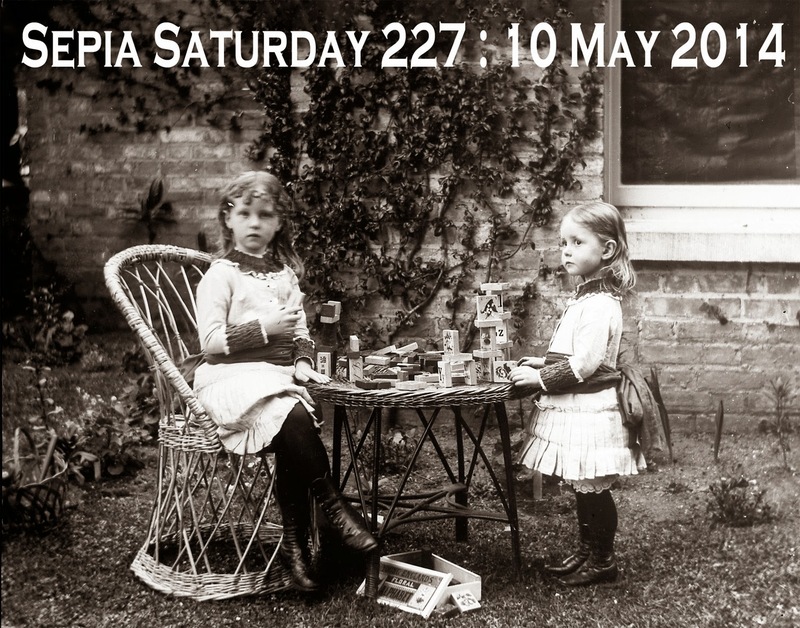 For Sepia Saturday 227 (post your posts on or around Saturday 10th May 2014) you can build your contribution from anything from A to Z and if that doesn't inspire you there are sisters, wicker garden furniture and even creepers to help you find an old photo and some new memories. Our theme photograph dates from around 1884 and is part of the National Library of Ireland stream on Flickr Commons. My thanks to Marilyn for looking after things last week (without all her efforts, Sepia Saturday would come tumbling down like a pile of wooden building bricks) and for choosing this interesting theme. Here is a quick look forward to see what we have coming during the rest of the month. 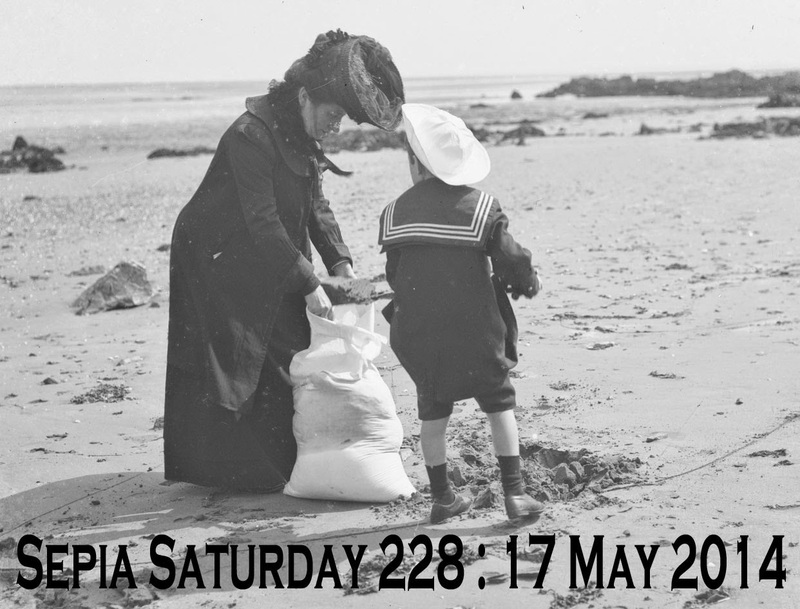 228 : sand, sandbags, sailor-suits, beachcombing, pilfering! Anyway, Before you Can Do 228 and 229, Each one of our Followers has Got to Have a go at 227, .... oh, that's enough of that. Just post your posts, add a link to the list below and be careful not to knock over that pile of bricks over there.